My husband and I are returning for a brief visit to Cambodia, as we make our way to Laos and tour through Vietnam, so I thought I would commit a couple of posts between now and when we leave to this brave little country. Brave? You ask ……….yes brave. At least that was the impression I got within the first day or two of my last visit there back in 2009 when we were invited to a wedding and stayed for two weeks. We had intended to travel through Vietnam as well, but that never eventuated as our wonderful hosts insisted on showing us their country, its rawness, its struggles, its beauty, its compassion, its history. Through all its crazy chaos, unruliness, lack of hygiene, lack of order, Cambodia smiles at you and welcomes you with open arms, yet underneath there is a sadness about this country that will leave you with vivid memories that will last a lifetime. When we left Cambodia, I had a new respect for these people, for all they have been through they smile……. such happy smiles. In 1975 the Khmer Rouge rebel soldiers took hold of the Cambodian capital Phnom Penh and making their way across the country they stripped it of everything, killing people, destroying buildings, homes, sending children to work in rice fields. They ruled for 4 years during which time 1.7 million Cambodian men, women, and children lost their lives and those who survived lived atrocious conditions. 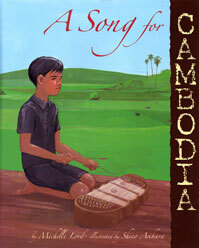 This is a true story of Arn a nine year old boy who grew up in a happy carefree countryside of Cambodia. His family of 11 brothers and sisters were musical, and his days were filled with laughter and music, his father teaching operas in the evenings, until one day in 1975, an army of soldiers called the Khmer Rouge invaded and destroyed everything he had known. Schools were made into prisons, buildings destroyed, monks were silenced, there was to be no music and families were separated and sent to different work camps. Arn was made to work long hours in the paddy fields, in all weather, with little or no food, with the other children in the children’s camp, and never saw his family again. 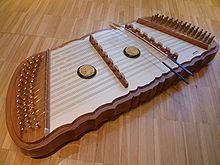 One day some children were chosen to learn to play a khim, a wooden string instrument. Because he could play well and learned fast Arn was allowed to play while the other children worked in the fields. The others who had tried to learn the instrument were sent to be executed. For four years he endured life in the camp under the threatening eyes of the soldiers, and when he was sent to fight the Vietnamese at age 12 he escaped and survived for three months in the jungle. I will leave you to read on to find how he was rescued and survived the floods. Also near the back is an afterword which tells us in 1984 Arn Chorn-Pond founded the “Children of War Organization” to teach teenagers in the United States about the horrors of war and hate. Arn eventually returned to Cambodia, believing in helping care for others in refugee camps he can then rid himself of his horrible past, as he said, “I must go and try to help rebuild Cambodia, but also rebuild my own life.” He received the Reebok Human Rights Award in 1988 for his work with survivors and founded Cambodian Volunteers for Community Development. In the United States he worked with gang members and other at-risk youth showing teens how to express their feelings through music, not violence. He was also awarded the “Spirit of Anne Frank Award” in 1996 for humanitarian work. In 1998 he created the Cambodian Living Arts program to revive the traditional art forms of Cambodia. He returned to Cambodia and found an old opera star of long ago digging through trash, a percussionist wandering the streets homeless and by bringing them and other musicians together recorded their songs and revive traditional Cambodian music. Today he still continues his work in Cambodia. The last words on this page reads…When a young boy, music saved his life. Now it is his mission to save the music. This entry was posted in Literature, Picture book, Picture Book Review and tagged Anne Frank, Asia, Cambodia, Khmer Rouge, Kiva, Phnom Penh, United States, Vietnam. Bookmark the permalink. I really enjoyed this informative review, Diane. I have only read adult literature about Cambodia and the Khmer Rouge and am delighted to be introduced to such a moving biography for children. What an amazing man Arn is, to have lived through such depraved experiences under Pol Pot, including being a child-soldier. I am sure that his beautiful music has been a key to his survival and healing. I so appreciate his courage in returning to his land to rebuild (as well as his wonderful ministry in the US). This is a book I would love us to buy for the school library. I hope you have opportunity to hear some traditional Cambodian music while you are there. Cambodia, Vietnam and Laos are three nations I would love to visit, so I confess to being a little jealous. Thankyou Joanna for your comments. Arn is indeed a remarkable young man and there are many websites attached to this book. Including the documentary movie The Flute Player on DVD is based on Arn’s life. Interesting you mention about the healing as in the jacket flap quotes : “His heartfelt music created beauty in a time of darkness and turned tragedy into healing”. I have been privilaged to listen to much of the music in Cambodia and indeed hope to avail myself again. I wondered if you had ventured to these countries, I think you will be captivated as I was………… a future destination in your journey of discovery perhaps……. I am glad you enjoyed this post and I hope you are able to obtain this book for your school library. Thanks again Joanna. Bravo Diane! What an exceptional and beautiful post. I enjoyed how you talked about Cambodia, your travel there and gave us a glimpse of the country, its history, and info about the Khmer Rouge, which I didn’t know. A nice set-up for sharing “A Song for Cambodia,” and the story about a remarkable child, and what he had to do to survive and find healing. I listened to the NPR tape and was moved by his ending comments about how the master musicians were killed, or stopped playing fearing death, leaving the country without its traditional musical heritage. Arn is one the few humble people you learn about in your life who touches your heart in ways you can’t explain. He is a true humanitarian. Through Arn’s his encouragement, many musicians started playing again and I hope have found healing. I never heard of a country losing its music “A Song for Cambodia” is certainly a book I will look for. A very moving and thought-provoking post. I am glad you enjoyed the post and I intend to post again about Cambodia, another book (adult), as well as posting on my “Travel Insight” later on. I came across this book quite by accident in the library, and thought it time I started mentioning about my up coming trip. Alot about what Arn was saying I had learnt, when I was last in Cambodia. “The Flute Player” should be a good DVD to get also Pat, as it sounds very interesting. The author, Michelle Lord, wrote the story after she had seen the documentary/movie. Moving and thought-provoking indeed! The book, and the experiences of Arn himself, sound both horrifying and redemptive. I wasn’t aware of all that the Khmer Rouge had done to Cambodia — I hadn’t realized at all about the musicians and the music. Thank you for sharing this, Diane — and have a wonderful trip to Cambodia. There is so much we don’t know Beth, I know I was stunned. The next (Cambodian) post of the adult book about a woman’s survival, is even more horrifying. I picked it up in Cambodia, read it on the plane coming home and cried. These people have been through so much. I tried to find a picture I had seen a couple of months ago, of Julie Andrews (standing in the same place as I did), looking at a board full of childrens faces in a prison called S-21 , where these children were executed. (photo was taken back in the 1980’s I think). One thing I do know is that Cambodia is alive with music today, played at funerals and weddings, everywhere. You will probably enjoy my Travel Insight post on Cambodia when I get round to putting it up. Thankyou for your comment Beth. Beautiful words, Diane, and a wonderful book. Thanks for telling me about your book review! Too bad these kinds of atrocities happen in our world. Glad youI enjoyed this post Tina. I thought you might be interested as you write your story of North Korea. It is a shame these things happen, but by letting the young learn maybe we can avoid it happening in the future.